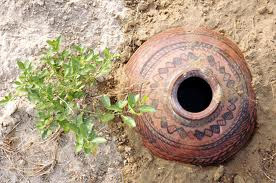 Vegetable growing by Pitcher (Clay Pot) Irrigation. A solution for low rainfed areas. 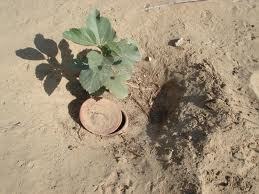 HomePitcher IrrigationVegetable growing by Pitcher (Clay Pot) Irrigation. A solution for low rainfed areas. Written about in Chinese texts 2000 years ago, utilized by the Romans, and now employed across Latin America, Africa, and Asia, clay pitcher irrigation is a low-tech solution that is helping thousands of communities in arid regions of the world cultivate farmland during dry seasons of the year. 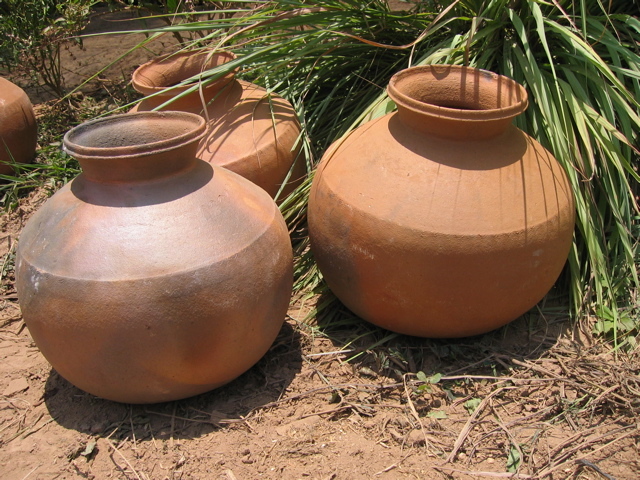 These buried, unglazed pots allow water to seep through the clay�s micropores and into the surrounding soil at a rate that is limited by the soil and the plant�s water uptake. This subsurface irrigation eliminates water losses to surface evaporation and infiltration through the soil, improving water savings by up to 70% over conventional surface irrigation methods. 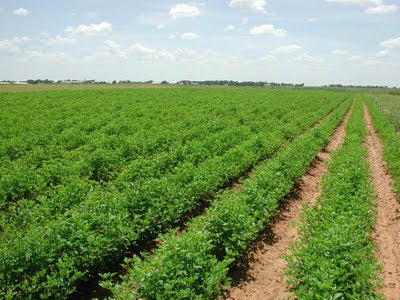 Furthermore, productivity is often increased since the plant�s energies are diverted from developing root mass needed for acquiring water, to increasing overall plant yield. Further benefits include decreased soil crusting and erosion, reduction in weeds, and improved efficiency in chemical fertilizers and insecticides applied through the pot. Clay pitcher irrigation is also beneficial in regions where soil salinity is a problem. Clay pitcher irrigation is a simple, low-cost solution for dryland farming. Unglazed clay pots with a capacity of seven to ten liters, a conical body and narrow neck, are buried approximately one meter apart with the mouth of the pot exposed. 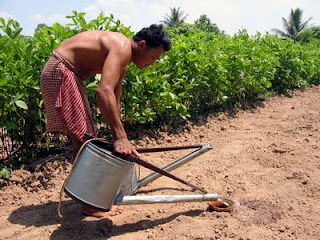 Crops are planted around each pot which are filled with water every four to seven days. Water loss from the pot is regulated by soil moisture content. As water is used by the plant, hydrostatic pressure in the soil decreases and water is transmitted out of the pot. When the surrounding soil reaches field capacity, water loss from the pot decreases. This natural, self-regulating mechanism is what makes clay pitcher irrigation extremely efficient. sustainable source of inexpensive pots, but also provides an outlet for income generation, benefiting the local economy. If suitable pots are not available, they can be easily made by hand or on a pottery wheel. Depending on the clay, sand, rice hulls, or sawdust may be added at a ratio of up to 1:4 to increase the porosity of the pots. Although closed-oven firing at temperatures exceeding 450 degrees Celsius is ideal, pots can be fired in open pits at temperatures of 200 to 300 degrees Celsius. Pitcher irrigation as been used successfully for plants, shrubs, and trees in small gardens as well as larger-scale farming with 3,000 to 5,000 pots per hectare. 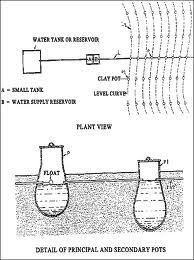 Many factors affect the efficiency of clay pitcher irrigation; the shape, porosity, and volume of the pot along with soil composition and the number of plants surrounding the pot. Ideally, the soil around each pot should contain a 20% to 50% mixture of compost and/or manure to improve soil composition and porosity. Sand may also be added to soils with a high clay content to further improve the soil. The distance between each pot is generally one to two meters between centers, depending on the crop.